Soft tissues, such as the brain, are rarely preserved so this finding represents a unique insight into these ancient creatures. "As far as we're aware it is the first example of a terrestrial vertebrate in the fossil record where you can actually see brain tissue preserved," says Cambridge University's Dr Alex Liu, co-author on the study released as a Special Publication of the Geological Society of London. The unassuming rock (pictured) was discovered by fossil hunter Jamie Hiscocks in Sussex, England, in 2004. It received no academic attention until 2009 when Liu's PhD Supervisor, Prof Martin Brasier from the University of Oxford, realised that markings on the stone's surface indicated it may contain brain matter. It was then analysed by Computed Tomography (CT) at the Natural History Musuem, London, and by Scanning Electron Microscopy (SEM) at The University of Western Australia. CT uses X-rays to build up a three dimensional model of an object's interior and was used to 'see' inside the fossil. To image the fossil's exterior SEM, which fires electrons at a sample and records how those electrons bounce off, was employed. These methods allowed scientists to identify the dinosaur's meninges, the tough tissues that sit between the skull and the brain protecting the latter. Beneath the meninges they observed structures thought to be the dinosaur's cortex, the brain's outermost layer, interlaced with blood vessels. 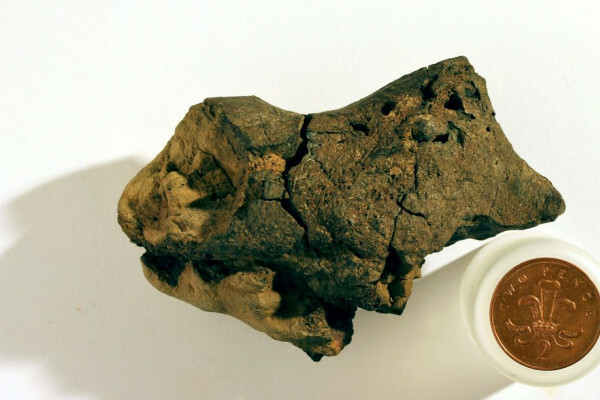 Dinosaur brains can now be compared to those of modern day reptiles and birds. In reptiles up to half of the brain cavity is filled with protective tissue whereas in birds, the direct descendants of dinosaurs, more of the skull is occupied by brain. For this dinosaur the meninges are thin and the brain was pressed close to the skull, making it more similar to birds than reptiles. Liu explains, "it seems the dinosaur brain might have filled considerably more of the space within the brain cavity than has previously been assumed and that dinosaurs might actually be slightly smarter than we give them credit for." He is cautious of this explanation because, "gravity would have allowed the brain tissues to sag within that brain case, and so the close association of the actual brain cortex with the side of the brain case walls might just be a preservation artefact." Although not able to conclusively answer if dinosaurs were bird-brains, this fossil provides encouragement for future investigations. Liu concludes "the key finding is that brain tissues can be preserved and this is something we haven't really appreciated before and there's a lot of scope in trying to find more examples of this and to learn more about dinosaur and vertebrate evolution." Why does the first tick take so long?